While not initially coined to describe a technical object, but rather a team of Open Badge enthusiasts willing to exploit the benefits of blockchains, BadgeChain is also a word that might be used in the future to describe a new technical object resulting from the merger of blockchains and Open Badges. When we started the BadgeChain group, the initial idea was to explore how blockchains could contribute towards improving the Open Badge technology and experience. There are a number of limitations to what one can do with Open Badges today that blockchains seem to be able to outsmart. Our initial reflection looked at the application of blockchain ideas to Open Badges. What has not yet been explored is the application of Open Badge ideas to blockchains: what could we do to blockchains if they used what we know about Open Badges? Both Open Badges and blockchains are related to trust but they do it in almost opposite ways. As I have written many times, Open Badges are trust statements that could be combined to create chains and networks of trust. The information on how the members of the network trust each other can be used as the basis to establish trustworthy transactions — if 32 Open Badge experts trust Slava’s expertise on badges as well as 53 clients, I’m inclined to trust Slava to work with me on my next project. Blockchains on the other hand are a means to establish trustworthy transactions even if those engaged in transactions do not trust each other. The trustworthiness of the transactions is not a property depending on the participants, their behaviour or the data they provide but on an algorithm controlling the trustworthiness of the next blocks added to the chain. The blockchain technology was designed to eliminate the human factor from making the decision on whether a transaction is trustworthy or not. NB: many articles on the Web describe blockchains as trustless. What is meant is that trustworthy transactions are possible without the involvement of any trusted authority (a bank, a notary or a registrar) and despite the fact that the parties involved do not trust each other. Trust is fully embedded in the blockchain infrastructure and does not need human intervention. 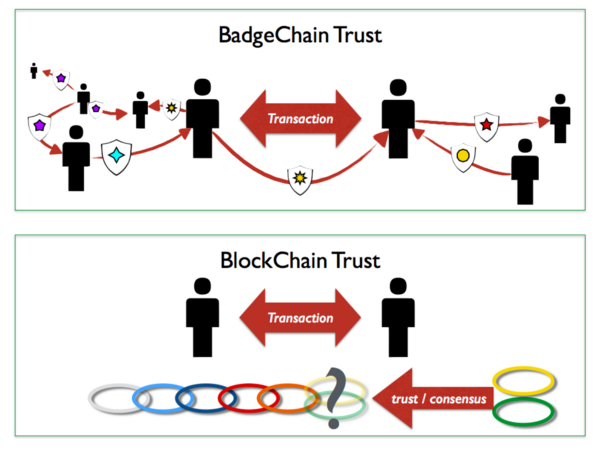 With the BadgeChain, trust is a property emerging from the participants’ behaviour, with blockchain trust is a property that ignores participants behaviour. One builds dynamic multidimensional networks i, the other an ever growing unidimensional chain. One is able to add and delete data (withdraw trust), the other can only add data (write only). One has emerged from the world of informal education, the other from the formal world of international business and finance. From the previous description, any attempt at combining blockchains with Open Badges into a new technical object might sound like the marriage of the carp and rabbit! Yet, it is what we are going to try to achieve. Assimilation: the blockchain provides a more secure way to store credentials, so institutions do not have to bother with Open Badges. Integration: the blockchain is a distributed database, where badges are stored as they would be in any other database (MySQL, Oracle, Fedora, etc.). The assimilation model is already in action and will soon be adopted by all those who do not see in Open Badges anything more than credentials. Let’s face it, blockchains, even in their infant stage, are far superior to the current Open Badge technology for storing academic credentials. Moreover it is an opportunity for institutions to reassess their power as credentialing authorities. After all, why bother with Open Badges if any institution can create their own private chain and put on it the data they wish. Organisations already in the credentialing business can move directly to the blockchain without having to go through the Open Badges stage. One of the main value propositions of the blockchain for integration is the ability create fully trustworthy and easy to verify records. Another main value is its ubiquitous database: the blockchain frees the storage of Open Badges from any individual storage, so badge holders are not forced to choose between one platform or another to store their badges. Service providers (e.g. issuing platforms) will be free to concentrate on added value services rather than trying to improve an idiosyncratic technology. how could Open Badges help in creating a new type of blockchain exploiting the trust relationships captured by Open Badges? The accommodation model starts with a question: how could Open Badges help in creating a new type of blockchain exploiting the trust relationships captured by Open Badges? It is what we are going to explore over the next posts, moving gradually away from the current Open Badge infrastructure to a possible BadgeChain infrastructure. Many thanks to Nate Otto for his comments and suggestions on the first draft of this series of posts. Conceptually fascinating. Great post. Serge, how would this apply to the non-formal, informal social networks that badge, e.g volunteer organizations? Thank you David. My focal point is how to model a ‘recognition’ technology that serves the needs of the informal sector without mimicking the formal sector (with ‘credentialing’). I hope that the following posts will bring the elements of a response to your question (3 more to come! ).